What is an Allure Beauty Enthusiast? A member of a community who can learn about, discuss and in some cases even test new products. Everyone can take part as much or as little as desired. My personal level of contribution is on the moderate side, which still equates to very little real time spent. I do at time click-through emails. Occasionally, I take part in quick polls. If I have extra downtime, I will even read the monthly newsletter. Head over to the site, and you will see there is not a lot to do on it. That is because everything is simple. More often than not, the take a study section is empty other than the perpetual address update. If they do need to mail you something, they want to make sure you get it. I get regular emails alerting me to the comings and goings, so if a chance to take part in a study pops up, you will usually get an email first. You will never log in and get the sense you missed anything. The only section I really look into is the Allure Access on the bottom right. That is the only section where I at times see things I did not get an email on. 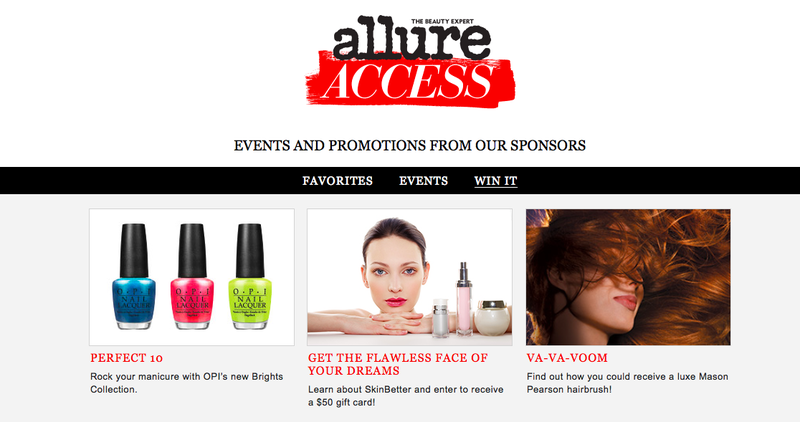 When you log into the Allure Access section, You will three options. All are self-explanatory. Favorites will show you some of the products the editors are feeling. You will at times see special offers or coupons in there. Special offers and coupons are also placed in the Win It category. More often than not, that is where you will find contests, sweepstakes and exclusive offers. Events are any Allure events happening around the country that Enthusiasts can either attend for a fee or even free in some cases. I am partial the to the Win it section. Every time I see a contest, I enter. We all enter contests at one time or another. Although, we have hopes, most of us never expect anything to come from it. Some of us even forget about it. A couple of months ago, I saw an entry form, which is still up, for a Skin Better contest. 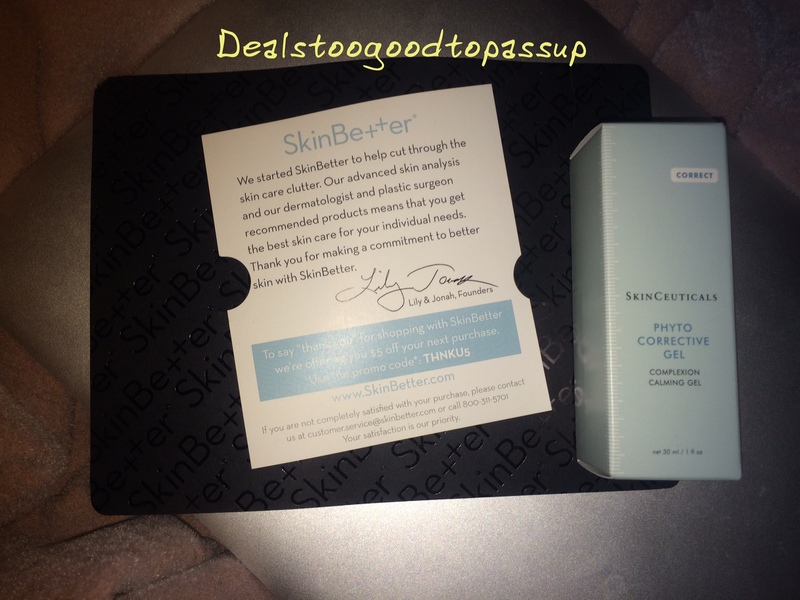 It said the first 200 people to enter before 07/31/15 would win a $50 gift certificate to a new website partnered with Allure magazine, called SkinBetter. On 05/20/15, I got an email stating I won. Considering there were only 200 winners, and I found it randomly (as in not due to an email), it was unexpected. I am not the sweepstakes winning type. That usually does not keep me from entering. My thoughts are always you never know what can happen, so it never hurts to try, right. If you agree with my thoughts, be sure to check into my Sweepstakes Page. Whenever I update promo codes, I add any Sweepstakes Opportunities I see there. As requested in the email, I responded with my information and was happy to see the E Gift Certificate come eight days later. It was a legitimate gift certificate for $50, not a discount code. This meant that I was able to combine it with a discount code when I placed the order. Unlike a regular gift certificate, this one has an expiration date of 07/31/15. The site itself is extremely well done. In addition to providing an overwhelming amount of details on all products, it also separates categories more than most websites. 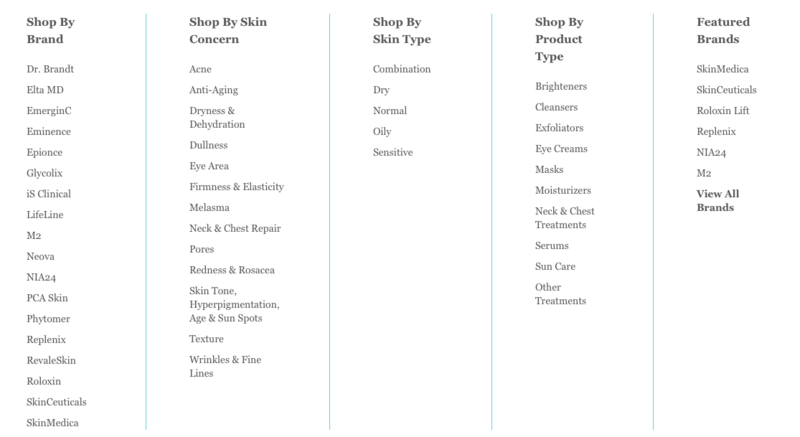 You can shop by brand, featured brand, skin concerns, skin type or product type. If you need assistance, they have you covered there as well. You can upload a picture of yourself. I highly suggest you upload one with a bare-faced and your hair pulled back. The first picture I uploaded had my hair down, and the their super specific system thought my hair was wrinkles. 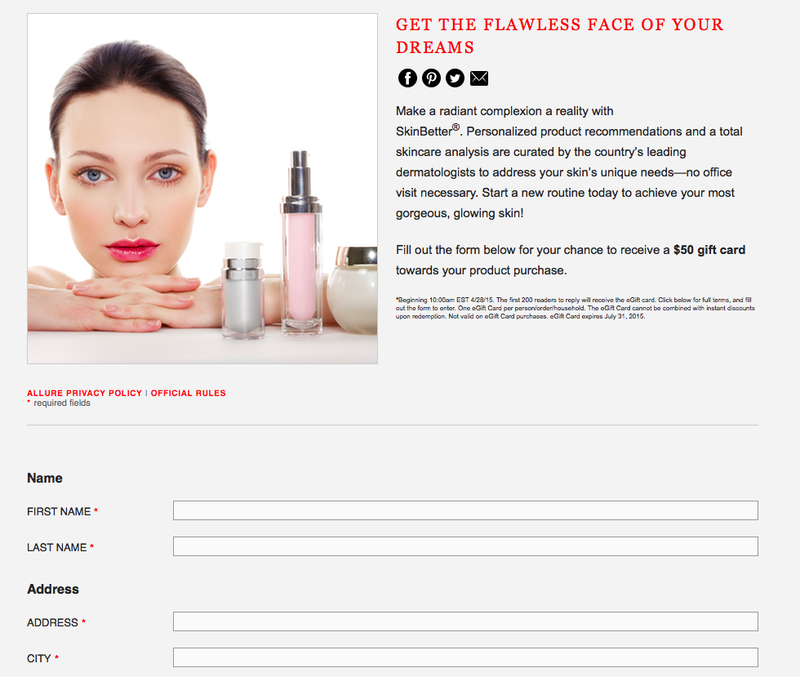 Once you’ve uploaded your picture, you create a skin care profile by answering a series of questions. 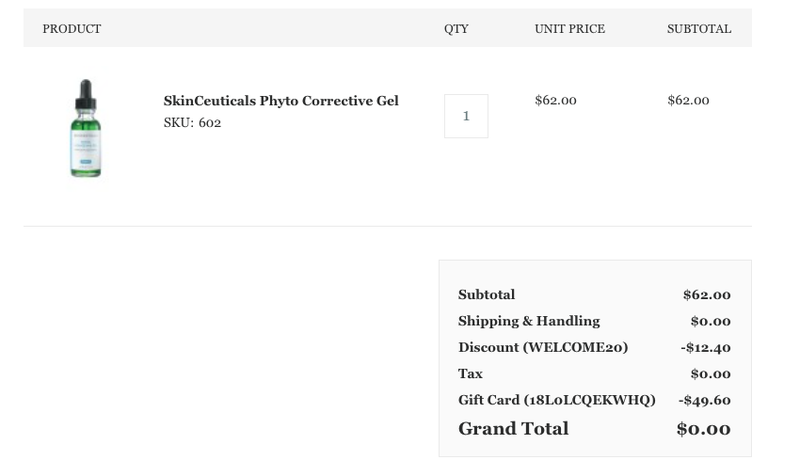 This tool is incredible, because I think about the sheer number of people who buy the wrong products, because they do not understand what’s going on with their skin. This takes a lot of the guesswork out of that. After you’ve completed this section, your results will pop up. The system will recommend a number of products for you. I have always wanted to try SkinCeuticals anything. The brand is known to be a better one. When I saw a product suggested for my skin, particularly to help with a stubborn dark spot on my face, I knew that was what I needed. It was the SkinCeuticals Photo Corrective Gel. When I first went to the website, I saw an option to subscribe to emails. I did. Before I checked out, I already had a welcome offer for 20% off. Combining the welcome offer with the 20% discount meant this item I was so excited to try would arrive for free. You may have noticed that I posted the gift card number in two places. It is a $50 gift card that does not expire until 07/31/15. The $0.40 credit is not much, but I am not going to use it before it expires. If anyone wants to place an order, here’s $0.40 on me! I placed the order late in the day on May 28th. The item arrived less than 48 hours later, so I was super impressed with the fast processing. It usually takes me a while to open new items, because my stash is insane. Using things in the order they arrive makes the most sense to prevent them from expiring before I can get to them. There is no way I could wait on this, so I immediately started using it the next morning, 05/31/15. Now that I have used the product for a little over a month, I can safely say I see why this brand is highly rated. I know this is the only item I’ve tried so far, but I really like it. A little goes a long way. Two drops almost always easily cover my entire face and neck. Sometimes, I use three when my skin is more dry. Despite using this twice a day, I still have a lot left. The formula is thin, so I combine it with a thicker serum. It smells like plants, so the Phyto element is strong. One month out, I am happy with the look of my dark spot. While it is not gone, it is lighter than where I started. I cannot wait to see what it looks like at the two month mark. 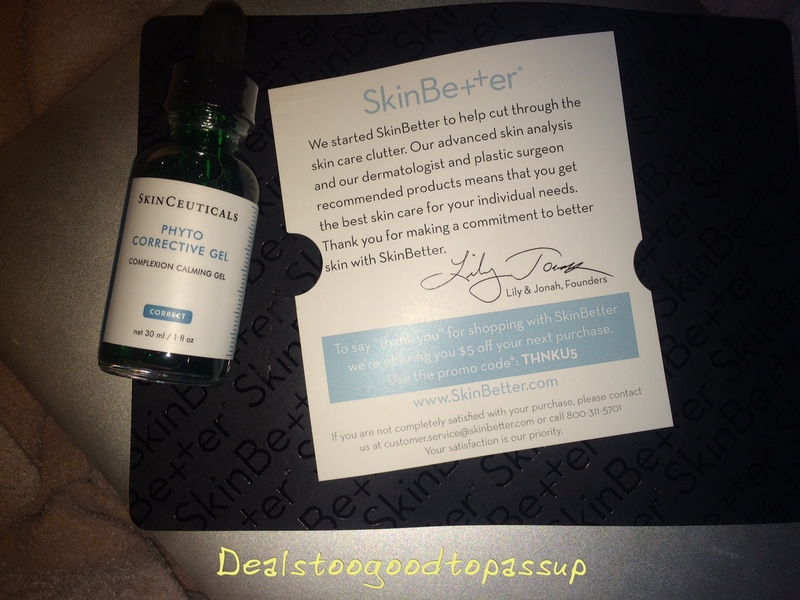 If you need help picking out skin care products, I highly recommend the SkinBetter website. The brands carried are respectable. I like that the 20% discount does not exclude the better brands either. You should definitely join the Allure Beauty Enthusiasts if you have not already. See all Allure Beauty Enthusiasts articles. View my main page for the guide map to the site and deeper deal exploration. that’s awesome! congrats on being one of the lucky winners! Thanks, I was excited, because I do not really win anything.